Biketoberfest 2018 Is Less Than A Month Away! October is just around the corner and excited bikers and motorcycle enthusiasts know exactly what that means: It’s time for Biketoberfest! In less than a month’s time, tens of thousands of bikers, motorcycle enthusiasts, and tourists will converge upon Daytona Beach, FL for Biketoberfest. This is an annual rally that highlights everything motorcycles, including races and live music! Whether you’re a full-time steel horse rider or a suburban family of five, Biketoberfest is sure to have something you’ll enjoy. 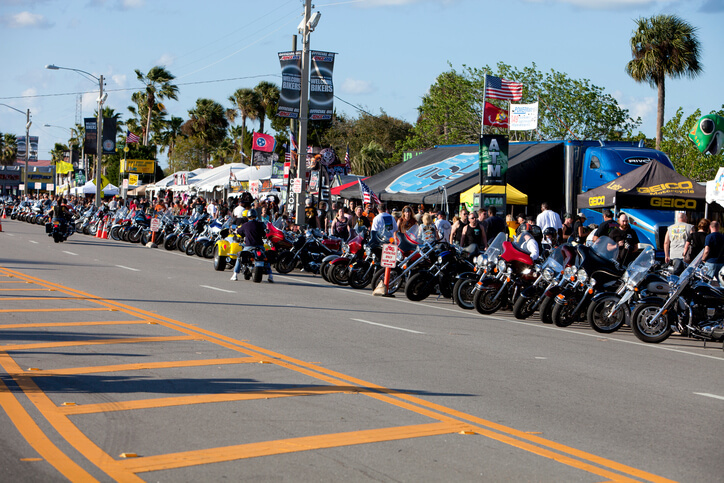 Every Biketoberfest supplies live music, scenic rides, delicious food, and motorcycle vendors. This year’s fest is no different! A hub for entertainment and events is Daytona’s Main Street. Indulge in free samples and nab the latest motorcycle gear, souvenirs and apparel from the vendor displays and booths along Main Street. As you browse through the booths and travel down the street you’ll hear live music flowing from Main Street Station, a Daytona Beach historical landmark that houses two open bars. If all of the walking is making you hungry, you can find BBQ being served at Full Moon Saloon. Feeling competitive? Make plans to enter yourself into a contest at Dirty Harry’s Pub and stay late for the around the clock DJ. You can’t overlook another Biketoberfest staple - the ONE DAYTONA epicenter will have free concerts on a nightly basis and a multitude of restaurants offering different cuisines and even a brewery. You can also stop by the Hard Rock hotel and choose from eight different bands that are performing rock, reggae and funk music; sit down for the concert and enjoy top notch food! Don’t worry, if late nights aren’t your style there will be a Bloody Mary Bar at Don Rico’s and a Champagne Brunch at Doc Bale’s Grill for the early risers to get your morning going. What’s Biketoberfest without a motorcycle ride? Hop on your bike and join the 125,000 motorcyclists that are all ready to ride seaside along A1A and through the historic state parks. Some of the most popular routes include the 12 mile Ormond Scenic Loop and Trail, Tomoka State Park, DeLeon Springs State Park and a ride to the Ponce de Leon Inlet Lighthouse. Plan to visit the Fall Cycle Scene at the Daytona International Speedway, you won’t want to miss out on all the activities happening here. Take part in contests and bike races; including a Winner-Take-All National Championship sprint. If you’re in the market for a new bike, pick out a Harley-Davidson or Yamaha to take on a demo-ride. Part, accessory and apparel vendors will also have booths set up at the motorcycle marketplace located at Daytona International Speedway. Biketoberfest offers a variety of booths and other vendors for passersby to check out. This year, 911 Biker Law will be in one of those booths! 911 Biker Law is a motorcycle accident and personal injury law firm located in Orlando, FL that caters to motorcyclists throughout the state. In the unfortunate event that you are injured in a motorcycle or car accident and the insurance companies involved aren’t compensating you fairly, you may require legal assistance. You’ll want someone on your side who has your best interest in mind as well as an in-depth knowledge of Florida motorcycle and insurance laws. At 911 Biker Law, we can provide you with the assistance you need and deserve for a reasonable price. Come check out our booth and meet head attorney, Michael B. Brehne. Michael is a former police officer and current motorcycle enthusiast who has a passion for helping his fellow bikers. He is also the author of the book “Watching Out For Motorcyclists: Legal Rights of Injured Bikers,” which will be available for purchase at our booth. We will also be offering “Free Tow” cards, which cover towing for the first ten miles to the closest repair facility. This offer is good for motorcycles only and valid for those who register with us at our booth or on our website at 911BikerLaw.com. Be sure to get your Free Tow Card before you leave for Biketoberfest! We are pumped for Biketoberfest and we hope you are too! Don’t miss out on the fun! See you in Daytona!